The robots are coming, you guys. And they want all of our ice cream. What are we going to do? We could call in the military, or we could devise some kind of electromagnetic pulse. Or, what the heck, let’s just stand out in the street and throw bricks at them. None of these ideas will work. But here’s a fun new game that knows the correct answer. Robots Love Ice Cream knows that all free people must be prepared to sacrifice everything to protect that freedom, and the same should be true of tasty desserts. So obviously the best course of action is to convert an ice-cream truck into a rolling tank that fires single-scoop cones with enough velocity to penetrate an invading robot’s cold, unfeeling metal hull. Robots Love Ice Cream has you going from planet to planet, protecting conveniently located ice cream warehouses from the robots’ Yoink Rays. The levels are round and 2D, and you drive your truck left and right to intercept and defeat the invaders. Defeated ‘bots drop Sprinkletonium, the material that inspired their love of ice cream. It’s also the material you use to buy upgrades to make your ice-cream weapons more effective. It’s a versatile material. Obviously, the best course of action is to convert an ice-cream truck into a rolling tank. The game is basically a combination of Space Invaders and Defender, and it’s charming as can be. The touch controls are a little iffy, though; the buttons to drive left or right are close enough together that I had a lot of missed presses. You hold your thumb on them to keep moving that way, but it might work better and with fewer slip-ups if a single tap sent you driving in one direction until you tapped the opposite. You have 21 worlds to visit and challenges to complete on each. Some of the extra tasks are more difficult until you’ve upgraded your weapons, and that’s kind of a problem because it can really take a while to save up enough glowy junk to buy the upgrades. You’re welcome to buy more or double your intake via in-app purchases, but doing it the old-fashioned way will take a lot of grinding. 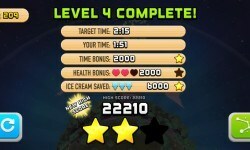 The Good: Cute graphics fun gameplay, robots, and ice cream. The Bad: Sprinkletonium is scarce, and the game has some control issues. The Verdict: It’s a fun mashup of some good ideas, but honest progress will take a while.